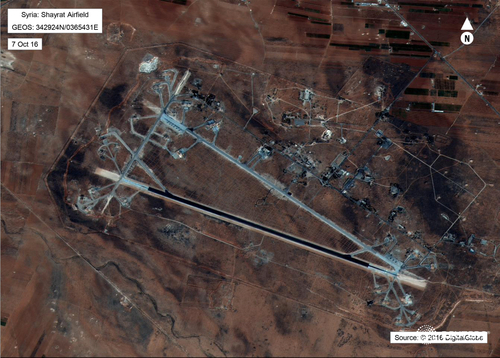 Syrian information minister says the U.S. strike on airbase was 'limited' and 'expected', does not expect military escalation. Japanese Prime Minister Shinzo Abe says he supports U.S. action to prevent the spread of chemical weapons. Iran denounced as "destructive and dangerous" U.S. missile strikes against a Syrian airbase from which a suspected chemical weapons attack was launched, Iran's state news agency IRNA quoted Foreign Ministry spokesman as saying on Friday. "Iran ... condemns use of chemical weapons ... but at the same time believes it is dangerous, destructive and a violation of international laws to use it as an excuse to take unilateral actions," IRNA quoted Bahram Qasemi as saying. 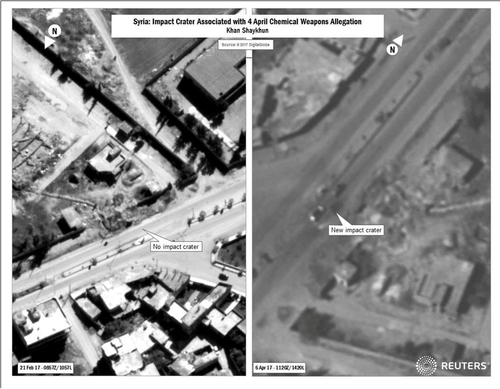 "Iran strongly condemns any such unilateral strikes... Such measures will strengthen terrorists in Syria ... and will complicate the situation in Syria and the region." Bonds, gold and the yen jumped in Asia on Friday, while stocks retreated, as investors fled to safe assets after the United States launched cruise missiles against an airbase in Syria, raising the risk of confrontation with Russia and Iran. A U.S. missile strike on an airbase near the Syrian city of Homs on Friday killed five people and wounded seven more, the Homs governor told the Lebanese TV station al-Mayadeen, saying he did not expect the casualty toll to rise by much. Homs Governor Talal Barazi, in separate remarks to Reuters, said the targeted airbase had been providing air support for army operations against Islamic State east of Palmyra, and the attack served the interests of "armed terrorist groups". "I believe - God willing - that the human casualties are not big, but there is material damage. We hope there are not many victims and martyrs," he told Reuters. 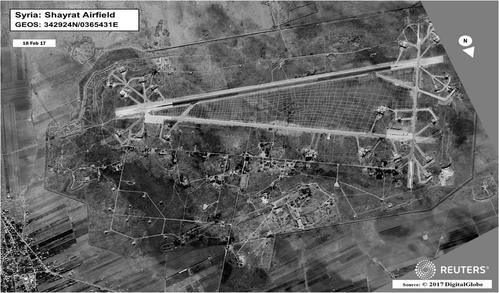 Russia's RIA news agency citing Syrian air base worker: significant damage done to air base by U.S. strikes, all planes out of action. Russian President Vladimir Putin believes that U.S. cruise missile strikes on a Syrian air base broke international law and have seriously hurt U.S.-Russia relations, news agencies cited the Kremlin as saying on Friday. Read more here. The United States fired dozens of cruise missiles at a Syrian airbase on Friday from which it said a deadly chemical weapons attack was launched this week, an escalation of the U.S. military role in Syria that swiftly drew sharp criticism from Russia. Turkish deputy PM Kurtulmus says views U.S. strike on Syrian air base as positive- Turkish Fox TV. Iran condemned a U.S. strike on a Syrian airbase on Friday as Britain and Australia gave their support, with Australian Prime Minister Malcolm Turnbull describing it as a "proportionate and calibrated response" to the use of chemical weapons. The Syrian Observatory for Human Rights said at least four Syrian soldiers including a senior officer were killed in a U.S. missile attack that had almost completely destroyed a Syrian airbase near Homs city. Saudi Arabia said on Friday it "fully supports" U.S. strikes on military targets in Syria, saying it was a "courageous decision" by President Donald Trump in response to the use of chemical weapons against civilians. "A responsible source at the foreign ministry expressed the Kingdom of Saudi Arabia's full support for the American military operations on military targets in Syria, which came as a response to the Syrian regime's use of chemical weapons against innocent civilians...," a statement carried by state news agency SPA said. The statement praised what it described as "the courageous decision" by Trump and said it holds the government of Syrian President Bashar al-Assad responsible for the military strikes. 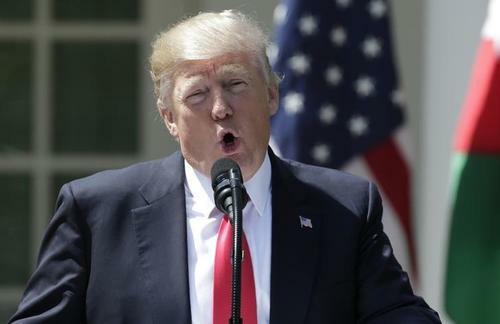 ReutersThe U.S. military launched cruise missile strikes ordered by President Donald Trump against a Syrian airbase controlled by President Bashar al-Assad's forces in response to a deadly chemical attack in a rebel-held area, a U.S. official said on Thursday. Live footage of U.S. warships firing Tomahawk missiles on Syrian airfield. President Donald Trump ordered the air strikes in response to a deadly chemical attack in a rebel-held area. A U.S. missile strike on an air base near Homs on Friday is not believed to have caused "big human casualties" but has caused material damage, Homs Governor Talal Barazi told Reuters. "I believe - God willing - that the human casualties are not big, but there is material damage. We hope there are not many victims and martyrs," he said by telephone. He said rescue and fire-fighting operations had been going on for two hours. “This clearly indicates the president is willing to take decisive action when called for and I think in this particular case the use of prohibited chemical weapons which violates a number of international norms and violates existing agreement called for thist ype of a response, which is a kinetic military response. I would not in any way attempt to extrapolate that to a change in our policy or our posture relative to our military activities in Syria today. There has been no change in that status." Hang Sang index down nearly 1 percent. "While I’m encouraged that the Trump administration has felt compelled to act forcefully in Syria against the Assad regime, I’m gravely concerned that the United States is engaging further militarily in Syria without a well-thought-out, comprehensive plan. Frankly, the president’s actions today generate more questions than answers." "My preliminary briefing by the White House indicated that this was a measured response to the Syrian nerve gas atrocity. Any further action will require close scrutiny by Congress, and any escalation beyond air strikes or missile strikes will require engaging the American people in that decision." 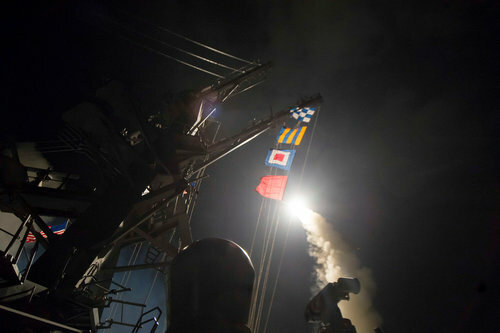 "While we all condemn the atrocities in Syria, the United States was not attacked. The president needs congressional authorization for military action as required by the Constitution, and I call on him to come to Congress for a proper debate. Our prior interventions in this region have done nothing to make us safer, and Syria will be no different." "What must follow is a real and comprehensive strategy to ensure that Assad is no longer a threat to his people and to U.S. security, and that Russia no longer has free rein to support his regime."